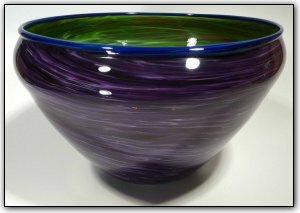 This low bowl features shades of Purples on the outside and the inside is full of shades of greens. This bowl also has an elegant blue lipwrap tying together the interior and exterior colors. Make sure to zoom in to see just how vivid the colors appear in the photos, and they are even more bright and vivid in person!